﻿When ﻿plotting ﻿the ﻿occurrence ﻿of ﻿different ﻿'Orsten' ﻿fossils ﻿on ﻿a ﻿world ﻿map, ﻿it ﻿becomes ﻿evident ﻿that ﻿these ﻿reflect ﻿the ﻿continent ﻿situation ﻿in ﻿the ﻿Cambrian ﻿quite ﻿well. 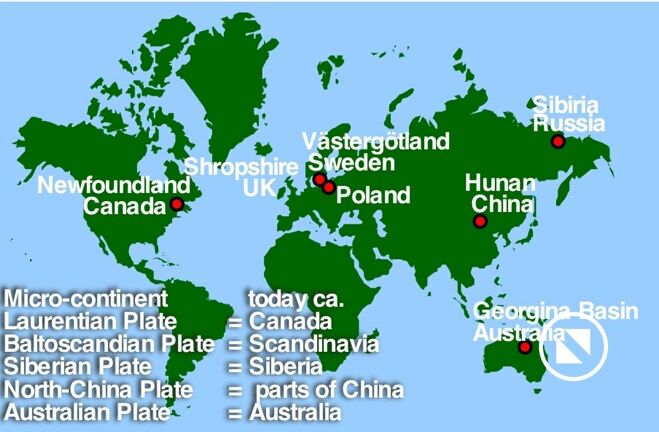 ﻿After ﻿the ﻿break-up ﻿of ﻿the ﻿large ﻿super ﻿continent ﻿Rodinia ﻿at ﻿the ﻿end ﻿of ﻿the ﻿Precambrian, ﻿a ﻿number ﻿of ﻿smaller ﻿continents ﻿lay ﻿like ﻿pearls ﻿along ﻿a ﻿line ﻿near ﻿the ﻿equator, ﻿north ﻿of ﻿the ﻿remaining ﻿Gondwana ﻿continent. ﻿Remarkably, ﻿no ﻿'Orsten'-type ﻿fossils ﻿have ﻿been ﻿reported ﻿from ﻿the ﻿continental ﻿areas ﻿around ﻿Gondwana ﻿so ﻿far, ﻿though ﻿the ﻿so-called ﻿"small ﻿shellies" ﻿are ﻿numerous ﻿(more ﻿on ﻿these ﻿in ﻿due ﻿course; ﻿see, ﻿e.g. ﻿papers ﻿by ﻿O. ﻿Elicki). ﻿The ﻿zero ﻿record ﻿of ﻿'Orsten'-type ﻿fossils ﻿from ﻿any ﻿of ﻿the ﻿coasts ﻿around ﻿the ﻿Gondwana ﻿continent ﻿requires ﻿further ﻿consideration. ﻿&squf; ﻿Georgina ﻿Basin: ﻿nemathelminths, ﻿phosphatocopines, ﻿type-A ﻿larvae, ﻿1 ﻿fragment ﻿of ﻿a ﻿putative ﻿marrellid ﻿(Arthropoda ﻿s. ﻿str. ﻿incertae ﻿sedis). ﻿&squf; ﻿one ﻿between ﻿China ﻿and ﻿Australia ﻿(nemathelminths, ﻿excl. ﻿the ﻿embryonic ﻿Markuelia, ﻿which ﻿may ﻿be ﻿owed ﻿to ﻿the ﻿proximity ﻿of ﻿the ﻿micro-continents. ﻿The ﻿overall ﻿distribution ﻿along ﻿the ﻿coast ﻿of ﻿the ﻿mentioned ﻿micro-continents ﻿is ﻿also ﻿reflected ﻿by ﻿wide ﻿distribution ﻿of ﻿phosphatocopines, ﻿but ﻿the ﻿Australian ﻿forms ﻿seems ﻿to ﻿have ﻿no ﻿apparent ﻿systematic ﻿connection ﻿to ﻿those ﻿of ﻿series ﻿3 ﻿and ﻿Furongian ﻿faunas ﻿not ﻿least ﻿because ﻿their ﻿appendages ﻿are ﻿lacking ﻿exopods; ﻿only ﻿the ﻿recently ﻿described ﻿species ﻿from ﻿Poland ﻿also ﻿lacks ﻿exopods, ﻿but ﻿it ﻿is ﻿much ﻿younger ﻿and ﻿closely ﻿allied ﻿to ﻿the ﻿Swedish ﻿hesslandonids. ﻿The ﻿connection ﻿of ﻿the ﻿continents ﻿is, ﻿furthermore, ﻿indicated ﻿by ﻿the ﻿yet ﻿by ﻿finds ﻿of ﻿Markuelia ﻿in ﻿Siberia ﻿and ﻿an ﻿uncertain ﻿occurrence ﻿on ﻿the ﻿North-American ﻿continent ﻿(Nevada). ﻿Species ﻿recognized ﻿as ﻿derivatives ﻿of ﻿the ﻿stem ﻿lineage ﻿to ﻿Crustacea ﻿were ﻿reported ﻿so ﻿far ﻿only ﻿from ﻿Sweden ﻿(all ﻿upper ﻿middle ﻿Cambrian). ﻿The ﻿eucrustacean ﻿Skara ﻿was ﻿reported ﻿from ﻿Europe ﻿and ﻿China, ﻿with ﻿a ﻿geological ﻿range ﻿from ﻿the ﻿upper ﻿middle ﻿Cambrian ﻿(Sweden, ﻿Poland) ﻿to ﻿the ﻿Furongian ﻿(China). 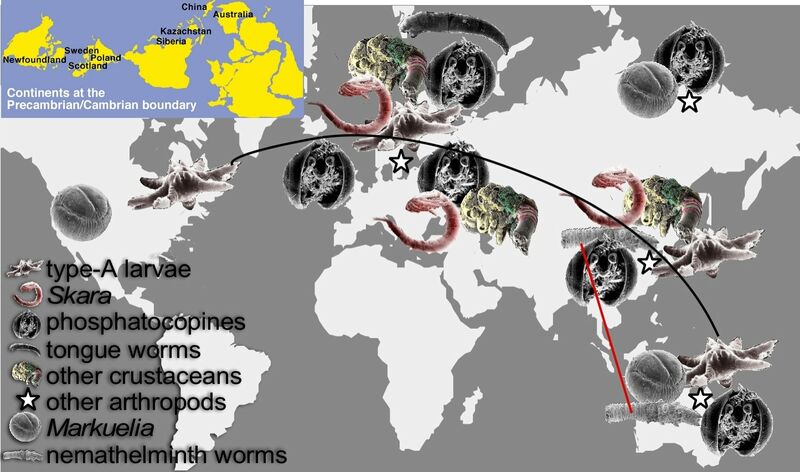 ﻿Other ﻿species ﻿assigned ﻿to ﻿Eucrustacea ﻿are ﻿also ﻿known ﻿only ﻿from ﻿Sweden ﻿(upper ﻿middle ﻿Cambrian ﻿to ﻿late ﻿Furongian) ﻿and ﻿China ﻿so ﻿far, ﻿but ﻿there ﻿from ﻿the ﻿Lower ﻿Cambrian. ﻿Again, ﻿micro-lobopodian ﻿"stem" ﻿arthropods ﻿(Arthropoda ﻿s. ﻿l.) ﻿in ﻿3D ﻿preservation ﻿are ﻿known ﻿only ﻿from ﻿Sweden ﻿(1 ﻿species) ﻿and ﻿China ﻿(unpublished). ﻿Yet, ﻿their ﻿macroscopic ﻿counterparts ﻿have ﻿been ﻿reported ﻿in ﻿flat ﻿preservation ﻿from ﻿the ﻿North ﻿America ﻿to ﻿northern ﻿Greenland ﻿(Hadranax ﻿augustus, ﻿see ﻿Budd ﻿& ﻿Peel,1998), ﻿Europe ﻿(Xenusion ﻿auerswaldae) ﻿and ﻿China ﻿(>10 ﻿species). ﻿Considering ﻿also ﻿certain ﻿micro-fossils ﻿called ﻿Microdictyon ﻿in ﻿small-shelly ﻿assemblages ﻿around ﻿the ﻿globe, ﻿which ﻿could ﻿be ﻿identified ﻿as ﻿plated ﻿cuticular ﻿elements ﻿of ﻿lobopodians, ﻿the ﻿range ﻿of ﻿lobopodians ﻿must ﻿be ﻿apparently ﻿much ﻿wider. ﻿Water ﻿bears ﻿or ﻿tardigrades, ﻿another ﻿"stem"-arthropod ﻿group, ﻿are ﻿known ﻿from ﻿possibly ﻿series ﻿2, ﻿formerly ﻿Middle ﻿Cambrian, ﻿of ﻿Siberia ﻿(still ﻿to ﻿be ﻿described ﻿taxonomically), ﻿but ﻿at ﻿least ﻿one ﻿unpublished ﻿specimen ﻿from ﻿China ﻿hints ﻿again ﻿at ﻿the ﻿strong ﻿connection ﻿between ﻿Siberia ﻿and ﻿China. ﻿The ﻿third ﻿group ﻿of ﻿stem-arthropods, ﻿tongue ﻿worms ﻿or ﻿Pentastomida, ﻿has ﻿been ﻿discovered, ﻿so ﻿far, ﻿only ﻿in ﻿Sweden, ﻿with ﻿a ﻿short ﻿geological ﻿range ﻿from ﻿the ﻿late ﻿Cambrian ﻿to ﻿the ﻿Lower ﻿Ordovician ﻿(Andres ﻿1989). ﻿Remarkably, ﻿these ﻿do ﻿not ﻿occur ﻿together ﻿with ﻿any ﻿of ﻿the ﻿other ﻿arthropods, ﻿but ﻿only ﻿with ﻿tooth ﻿elements, ﻿conodonts, ﻿of ﻿conodontophorids, ﻿fish-like ﻿craniote ﻿euchordates ﻿("not-yet" ﻿vertebrates). ﻿This ﻿might ﻿give ﻿some ﻿information ﻿on ﻿their ﻿occurrence ﻿and ﻿life ﻿strategies, ﻿and ﻿their ﻿long-lasting ﻿host/parasite ﻿association ﻿with ﻿craniotes ﻿– ﻿and ﻿NOT ﻿with ﻿arthropods ﻿(contrasting ﻿Siveter ﻿et ﻿al. ﻿2105, ﻿depicting, ﻿in ﻿our ﻿view, ﻿a ﻿piece ﻿of ﻿dirt ﻿but ﻿not ﻿an ﻿animal). ﻿Besides ﻿arthropods, ﻿there ﻿is ﻿only ﻿one ﻿more ﻿metazoan ﻿taxon ﻿preserved ﻿in ﻿'Orsten' ﻿type ﻿3D ﻿preservation, ﻿namely ﻿an ﻿in-group ﻿of ﻿roundworms, ﻿nemathelminths, ﻿called ﻿cycloneuralian ﻿(because ﻿of ﻿their ﻿ganglial ﻿nerve ﻿ring ﻿instead ﻿of ﻿a ﻿frontal ﻿pair ﻿of ﻿ganglia ﻿= ﻿no ﻿head ﻿developed). ﻿This ﻿in-group ﻿taxon ﻿possesses ﻿a ﻿chitin-bearing ﻿cuticle ﻿that ﻿has ﻿to ﻿be ﻿moulted, ﻿similar ﻿to ﻿the ﻿situation ﻿in ﻿arthropods, ﻿but ﻿in ﻿our ﻿view ﻿convergently ﻿evolved ﻿since ﻿other ﻿features ﻿are ﻿simply ﻿basal ﻿and ﻿do ﻿not ﻿go ﻿back ﻿to ﻿a ﻿common ﻿ancestor. ﻿Longer ﻿known ﻿are ﻿2D ﻿preserved, ﻿cm ﻿long ﻿but ﻿slim ﻿so-called ﻿palaeoscolecids, ﻿worms ﻿with ﻿a ﻿cuticle ﻿made ﻿of ﻿numerous ﻿small, ﻿button-like ﻿plates. ﻿Isolated ﻿plates ﻿were ﻿described ﻿as ﻿Hadimopanella ﻿and ﻿others ﻿within ﻿"small ﻿shelly" ﻿assemblages ﻿(e.g. ﻿Hinz ﻿et ﻿al. ﻿1990), ﻿long ﻿before ﻿the ﻿finds ﻿of ﻿pieces ﻿of ﻿the ﻿worms ﻿in ﻿3D ﻿(Müller ﻿& ﻿Hinz ﻿1993). ﻿If ﻿the ﻿records ﻿can ﻿be ﻿confirmed ﻿in ﻿the ﻿future, ﻿the ﻿embryonic ﻿form ﻿Markuelia, ﻿actually ﻿a ﻿late ﻿larva ﻿still ﻿inside ﻿the ﻿egg, ﻿it ﻿has ﻿a ﻿similarly ﻿wide ﻿distribution ﻿as ﻿the ﻿type-A ﻿larvae, ﻿and ﻿its ﻿geological ﻿record ﻿ranges ﻿from ﻿the ﻿Cambrian ﻿series ﻿2 ﻿to ﻿the ﻿Lower ﻿Ordovician. ﻿Another ﻿tiny ﻿nemathelminth ﻿became ﻿known ﻿from ﻿the ﻿Cambrian ﻿series ﻿2 ﻿from ﻿Australia, ﻿clearly ﻿an ﻿early ﻿larva, ﻿a ﻿number ﻿of ﻿other ﻿larvae ﻿known ﻿from ﻿their ﻿vase-like ﻿trunks, ﻿loricae, ﻿apparently ﻿a ﻿feature ﻿shared ﻿with ﻿the ﻿tiny ﻿Recent ﻿vase ﻿animals, ﻿loriciferans, ﻿and ﻿the ﻿priapulids, ﻿which ﻿range ﻿from ﻿being ﻿tiny ﻿to ﻿forms ﻿being ﻿more ﻿than ﻿10 ﻿cm ﻿long. ﻿The ﻿missing ﻿record ﻿of ﻿even ﻿a ﻿fragment ﻿of ﻿such ﻿animals ﻿from ﻿the ﻿localities ﻿in ﻿Europe ﻿is ﻿striking ﻿and ﻿has ﻿no ﻿explanation ﻿yet. ﻿It ﻿also ﻿becomes ﻿clear ﻿that ﻿preservation ﻿of ﻿'Orsten'-type ﻿fossils ﻿from ﻿different ﻿times ﻿may ﻿be ﻿caused ﻿by ﻿different ﻿reasons ﻿and ﻿are ﻿not ﻿necessarily ﻿from ﻿nodular ﻿limestones, ﻿as ﻿in ﻿Västergötland, ﻿Sweden. ﻿This ﻿will ﻿be ﻿investigated ﻿in ﻿more ﻿detail ﻿in ﻿the ﻿future. ﻿&squf; ﻿Maas, ﻿A. ﻿Braun, ﻿A., ﻿Dong ﻿Xiping, ﻿Donoghue, ﻿P., ﻿Müller, ﻿K.J., ﻿Olempska, ﻿E., ﻿Repetski, ﻿J.E., ﻿Siveter, ﻿D.J., ﻿Stein, ﻿M. ﻿& ﻿Waloszek, ﻿D. ﻿2006. ﻿The ﻿‘Orsten’ ﻿– ﻿more ﻿than ﻿a ﻿Cambrian ﻿Konservat-Lagerstätte ﻿yielding ﻿exceptional ﻿preservation. ﻿Palaeoworld ﻿15, ﻿266-282. ﻿&squf; ﻿Budd, ﻿G.E. ﻿& ﻿Peel, ﻿J. ﻿S. ﻿1998. ﻿A ﻿new ﻿xenusiid ﻿lobopod ﻿from ﻿the ﻿Early ﻿Cambrian ﻿Sirius ﻿Passet ﻿Fauna ﻿of ﻿North ﻿Greenland. ﻿Palaeontology ﻿41(6), ﻿1201-1213. ﻿&squf; ﻿Hinz, ﻿I., ﻿Kraft, ﻿P., ﻿Mergl, ﻿M. ﻿& ﻿Müller, ﻿K.J. ﻿1990. ﻿The ﻿problematic ﻿Hadimopanella, ﻿Kaimenella, ﻿Milaculum ﻿and ﻿Utahphospha ﻿identified ﻿as ﻿sclerites ﻿of ﻿Palaeoscolecida. ﻿Lethaia ﻿23, ﻿217-221. ﻿&squf; ﻿Müller, ﻿K.J. ﻿& ﻿Hinz-Schallreuter, ﻿I. ﻿1993. 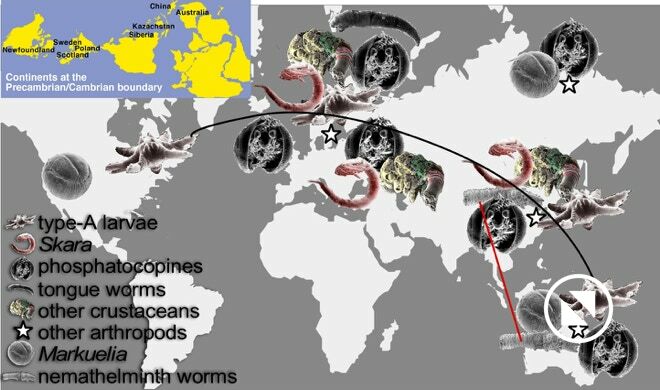 ﻿Palaeoscolecid ﻿worms ﻿from ﻿the ﻿Middle ﻿Cambrian ﻿of ﻿Australia. ﻿Palaeontology ﻿36(3), ﻿549-592. ﻿&squf; ﻿Siveter, ﻿Da.J., ﻿Briggs, ﻿D.E.G., ﻿Siveter, ﻿De.J. ﻿& ﻿Sutton, ﻿M.D. ﻿2015. ﻿A ﻿425-million-year-old ﻿silurian ﻿pentastomid ﻿parasitic ﻿on ﻿ostracods. ﻿Current ﻿Biology ﻿25, ﻿1632–1637.